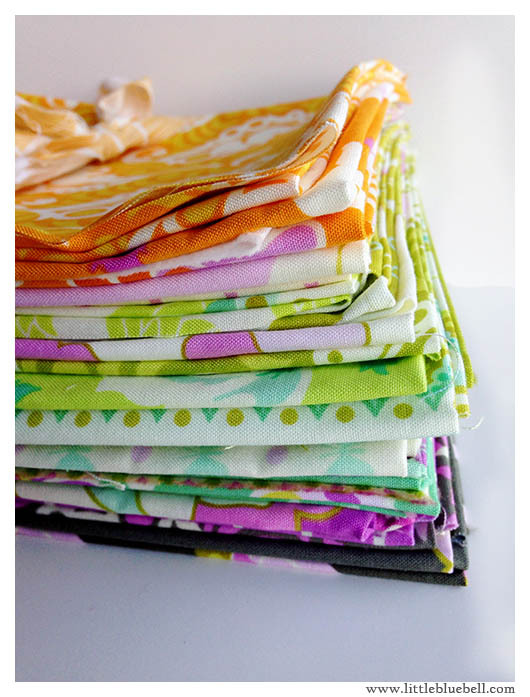 Little Bluebell: Sew Mama Sew Giveaway Day! Happy Giveaway Day! Welcome, I am so happy you are here!! I've been saving a really awesome giveaway just for you. Earlier this year my husband bought two fat quarter bundles of Lottie Da by Heather Bailey, one for me and one for a lucky blog reader. He's fun that way!! I made a chevron quilt with mine. What will you make with yours? 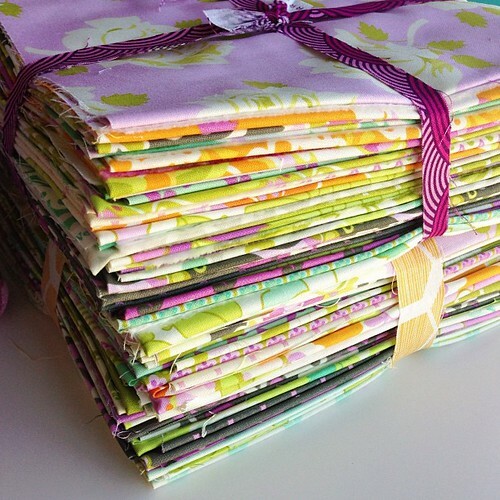 30 piece Fat Quarter Bundle of Lottie Da by Heather Bailey. This bundle includes an 18"x22" piece of each print in the collection. That is the equivalent of over 7 yards of fabric! International entries are welcome. The winner will be contacted via email so please make sure it's listed (or can be found in your profile). Giveaway ends December 13th at 5pm PST. 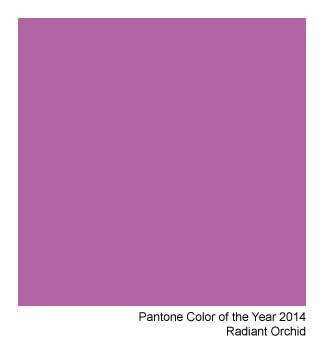 Pantone just announced Radiant Orchid as the color of the year for 2014. In her Lottie Da collection, Heather Bailey mixes orchid with charcoal, tangerine, lime, wintergreen and silver. What color would you use with Radiant Orchid? Leave one comment below. 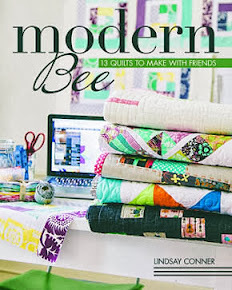 Head over to Sew Mama Sew for more blogs to visit and more giveaways to enter. The first thing that comes to mind to use with Radiant Orchid is Lemon Yellow! My colour to use with radiant orchid would probably be a blue. I'm thinking a deep, dark nay or a a denim blue. I would use orange or yellow. Lemon yellow or red orange would be gorgeous with this color. It will be fun to see if the fabric collections next year incorporate it too. Thanks for the chance to win! Thank you so much! 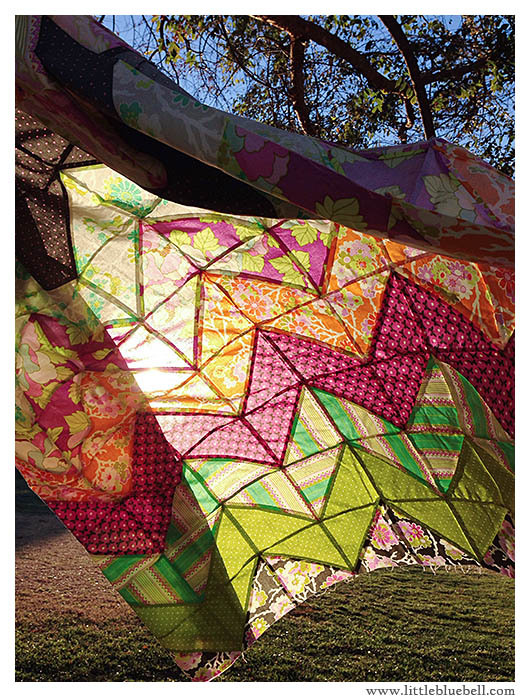 I think, it woul be a nice magic lantern quilt, because of all this bright colors. I love this Radiant Orchid! It's begging to be mixed with neutrals to make it pop. I'd go black, charcoal, cream, and maybe some really light pinky peach. Maybe a deeper purple like "Tulip" or a blush/peach color. 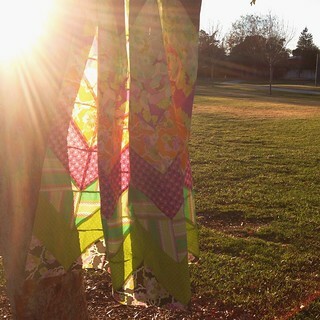 The colour looks great with lime green in the leaf print on your quilt, so I too will go with that colour. I like the charcoal but maybe it would go with a bright aqua as well. Thanks! What a beautiful happy colour, perfect for a purple loving person like me who just had a baby girl. I would pick lime. What a pretty color! My first thought was gray or yellow, but a nice royal blue would look lovely too. Thanks for the great giveaway. Merry Christmas. I would use grey's - lots and lots of different shades of grey! Not too original, but I would pair the orchid with charcoal gray, too. You and your husband are such a generous couple! Lovely giveaway - thanks. I'd use an orange, I love the look of pinky colours with orange. Thank you for this beautiful giveaway! I would use lime green with radiant orchid. I would mix it with greens or greys or both. Looks like Orchid needs some orange to go with it. I'd go for a orange, yellow for teal, same value as the orchid in use. Thanks so much for the chance. Lime green! Thanks for the giveaway. I think it would look great with a nice gray. I would add greys/blacks/deep rose/mint and goldish yellow with the Radiant Orchid. Thanks for a chance to win! It made a grey and purple plus quilt that was fabulous, but I think I'd like orange with the purple,too. thanks for a great giveaway. I love it with the charcoal. Thanks so much for the generous giveaway! I'd pick something with nice contrast, like a yellow or maybe an orange, since they're on the opposite sides of the color wheel. I'd use chartreuse and the greys look great with it also! thanks so much for a fab giveaway! and thank you to your husband too :)! I love the colors she put it with but I think it woud also look great with a bright turquoise. Probably a green of some sort! What a guy!!!!! I'd love that! I bought a jelly roll of it, but it is so pretty, I'd love to make something bigger! I would use Navy! I love navy and think it would look great - thank you! and i would use some orange with it or green. It's an interesting color - one I don't usually use. How about combining it with aqua and charcoal? I would use Lemon Yellow with Radiant Orchid! It needs a touch of minty green and some silver to spread out the tone a bit! Gray, white, and either the new Kona wasabi or cactus. I would use Charcoal, and Lime Green with Radiant Orchad. First of all, this is an amazing giveaway! 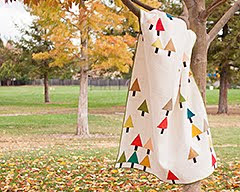 I love your zigzag Lottie Da quilt, it's just the perfect pattern for this fabric! If I was making a quilt with Radiant Orchid, I'd include every shade of purple, as well as charcoal, and then just tiny little bits of orange and chartreuse. I would use Robin Egg! This is a great giveaway! Thanks! I think I would go with a yellow. purple is hard for me....I go to neutrals. Black and natural linen. thank you for the chance to win! I love purple and gray together! I love that shade with charcoal gray. I'd use it with a pea shoot green! I would add in some solid lime green. 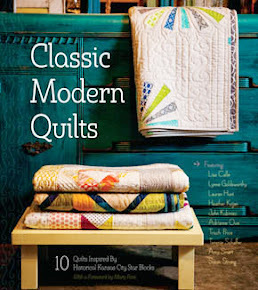 It would be a wonderful spring quilt. I would use a soft cool gray. Purple and gray, maybe a purple-ish gray, yummy!! What about turquoise ? Thanks for the great giveaway and Joyeux Noel ! Gray. I always go with gray. It's my go-to neutral. I would use apple green or white! I'd mix it with tangerine! Great giveaway! I would use green or yellow! I'd use orange, lime and yellow. That orchid color goes with so many different colors though. I would use turquoise. Thanks for the chance! I'd use lime and silver, but it's a tough choice as that is a gorgeous color. I would use orange. Thanks for the chance to win! I'd use darker and lighter shades of pink to make a quilt with different tones of the same quilt. Wow! Great giveaway! I'm really loving grey paired with super-bright colors right now, so that's what I'd pair with the orchid. Thanks for the chance to win. Lime green, a rich yellow, a lush orange and a raspberry pink! Orange! Thanks for the chance! I would choose the charcoal gray - lovely combo and a wonderful giveaway!! Thanks for the chance to win! I would use yellow for sure. Thanks for the chance to win. It is truly a FABULOUS giveaway! I'd use lemon green and fuchsia. Thanks for the chance! What a great giveaway! I love color, so I think I'd pair it with a golden yellow and a splash of navy to make it all pop! I would pair it with a blue, like cobalt or turquoise. Thank you for the chance to win such a great giveaway! I would love to see teal with that color. So gorgeous! I would use Teal Blue! black would be great although I love the idea of charcoal as well! A minky grey..... or a really nice green. Or both! Probably a pale green, but I don't know. Thanks so much for the chance! I'm not sure I've ever worked with a color close to Orchid so I'm not sure...guess I'll find out this year since it will be popular :). 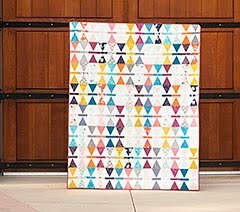 I love the way you chose to show off the prints in your quilt. Thanks for a chance to win a great bundle! A frosty Blue. I love Orchid. Happy to see it as the color this year. Thanks for the generous giveaway! I would mix radiant orchid with charcoal and lime green. A green - maybe 'sprout' ?? A shade of gray for sure!!! Gold would be my choice. I love using orchid with Rust and Dark Chocolate! Tangerine, I think. Thanks for the amazing giveaway! I think I would go with an aqua or teal. Thanks for a fab giveaway and to your hubbie too of course. I like orchid and charcoal together. A charcoal background would be great for any quilt I would make with this fabric. Lots of bright colors would look good with this. I'd have to include teal and some pale gray to give it ballance. A forest green would go well with purple. I like orchid paired with lime! I'd use Charcoal, Lemon Yellow and/or Forest Green. I think I would pair it with silver...that would be so regal and expensive looking! i love it with the charcoal. I'm so excited that orchid is the color of the year! I would pair it with a range of blues. I think a raspberry color along with bright yellow would look awesome! I've always like that color with lime green. I'd pair it with charcoal - yummy! Thanks for such a great giveaway! I really like the colors listed above. I'd stick with most of them. Oh definitely a bright limey green. Love this bundle, thanks for the chance! I think I would do a dark grey. Thank you for the giveaway! The orchid and grey are perfect in my book. You should see pictures of my orchids. Beautiful colour... I would use teal!! I would have to mix it with a red/orange color to make it really pop! I like white or gray. Thanks for the giveaway! For me pink and turquoise are really pretty. Thank you for the opportunity to win such beautiful fabrics. Love a celery green with it! Thanks for the give-away. i think i'd like to find a blue to go with that colour! I think I would use dark grey with it. Thank you for hosting the giveaway. I love your chevron quilt. It is very pretty. I'd use a grey - my current favorite color. Thanks for the chance! I would use lime and pink. Thank you for the giveaway! Oh wow!! 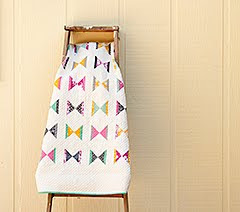 love your quilt...I would put it with gray and yellow...a mild fushia would be pretty too. I would use a pale grey. Thanks for the chance at this great giveaway! A charcoal grey or silver. Wow! What a great giveaway! I think I would use some kind of bright green but who knows...I have to have it in my hand to decide! I love the lime greens in this line, they go beautifully with the purples! kiwi green for sure! Such a pretty collection. I think I'd go with a gray or a yellow. Thanks for the chance to win--I love this line! Oddly enough I really like a sherbert orange with that purple... it would be really fun for summer! Thanks for the chance to win these beautiful fabrics! I'm all about purple and charcoal!! I'm loving this color and would try a rich teal or pale aqua with it! Thanks for a wonderful giveaway. I think it would look good with a middle grey. Thanks for the chance at winning. Orange! Thanks for the chance to win!! Gray would look nice with the orchid. Aqua would be lovely with it. I think I would use a jade greenish/ turquoise-y color. Or black. I think it would really, really pop next to black. well, how very nice of your hubby. I think I would add teal. thanks for the giveaway and Merry Christmas. I can never imagine my husband buying picking out and buying fabric for me, your very lucky. I would pair it with a soft grey or soft yellow. Beautiful quilt!!!! I would pair it with a turquoise or a blue green....I love lottie da! What a fabulous giveaway. And what a fabulous husband. Thanks for the chance to win. Either black or white, depending on my mood. Both would provide a good contrast to orchid. Lime green and grey would look fabulous with the orchid!! I would use orange or blue! Tangerine and Mint Green. Thanks to you and hubby for the awesome giveaway! Lime green for sure! Your quilt is beautiful! 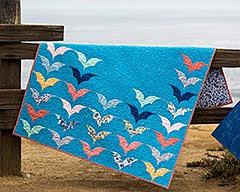 Having just used some Kona 'Sprout' to bind a baby quilt and falling in love with it I'd choose that to pair with orchid! I love your quilt! I will most likely use aqua with the new orchid. I love aqua with pretty much anything! I think Mint would be gorgeous with Orchid! I would love it with teal, aqua, and gray. Thanks for the giveaway! I am not surprised it is the color of the year! I have a dress in that color. I can always count on a compliment when I wear that dress. It is the perfect color for my fair complexion. I have a scarf that has pale blue and peacock blue along with the orchid that is a smashing combination! I think it would look great paired with a darker eggplant. Love the chevrons! Pinking colors is one of my challenges, but I would add a dark plum. Thank you for the giveaway! HELLO, wouldn't 'Sprout' be beautiful! Thanks for a super generous+beautiful giveaway! What a great giveaway! I would use lime or apple green with the orchid. gray. Thanks for the giveaway and Merry Christmas! Teal would be my pick. Thanks for the chance to win! I think gray. Great giveaway! Gray! Love gray with any colour. I would totally do chevrons with these! Gorgeous! Lime green! Thanks for the chance for the lovely giveaway! Wonderful giveaway! I would love to use a very sharp citris looking yellow with that color! I would use citrus colors - oranges and yellows and maybe even greens. Lovely! I love charcoal with the new pantone color of the year! Thanks for the chance to win! I am liking lime with the orchid & a nice grey.